Addictions and substance abuse disorders continue to spread throughout the nation, touching millions of Americans regardless of race, geographic location or socioeconomic status. According to the National Institute on Drug Abuse, 25 million Americans reported illicit drug use within the past year. As the epidemic grips the nation, the need for more health care professionals to combat addiction and substance abuse disorders is paramount, according to Dr. Mercy Mumba, a UA nursing researcher who studied the role of nurses in addiction care and looked for ways to expand their roles. Unfortunately, nurses are plagued by a stigma of not being important members of the treatment team for many reasons, including limitations related to their ability to treat substance use disorders and specialized research being conducted by nurses in this area. Mumba believes with proper education and training as well as empowerment as valuable members of multidisciplinary teams, nurses will become better advocates for their patients and lead evidence-based research that improves patient outcomes. This will bring more credibility from their colleagues. 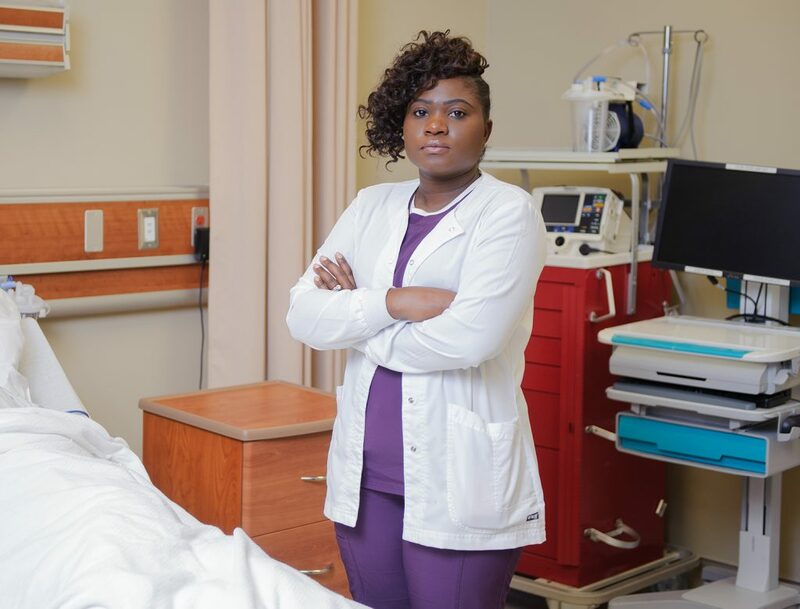 “A lot of research conducted by nurses in this area has not been in the basic science arena, and I feel like that has contributed to the perception that nurses aren’t doing enough research in this area,” said Mumba. Developing more interdisciplinary research teams will ensure expertise from other fields can complement the research and improve its rigor, she said. “More collaboration across the board will help nurses gain more respect because other disciplines will learn about and appreciate the specific expertise nurses bring to the table,” Mumba said. Although there are many nurses who work in psychiatric and substance abuse disorders settings, at the moment, there are only two certifications that allow nurses to specialize in addiction care. These certifications are offered by the Addictions Nurses Certification Board, part of the International Nurses Society on Addictions. UA research has found nurses are underutilized in treating addiction. While many undergraduate nursing students may not want to work in psychiatric nursing specialties after graduation, Mumba suggests all nurses need to receive more training in psychiatric mental health, particularly substance use disorders. Nurses need to be prepared to treat patients in the general population who have, along with acute problems, psychiatric mental health disorders, not just patients treated in psychiatric mental health facilities, she said. According to Mumba’s work, the American Association of Colleges of Nursing is working to increase the number of baccalaureate-prepared nurses in clinical settings to play a vital role as effective team members and leaders in psychiatric/addictions settings. Nursing schools across the country are becoming more strategic in the incorporation of what is called SBIRT training in their curriculum, which is Screening, Brief Intervention and Referral to Treatment, said Mumba. “Teaching SBIRT in nursing school is one of many opportunities we have to effectively train nurses, especially with the literature showing that many nurses do not feel adequately trained in this area,” she said. Despite the current limited scope of care provided by nurses in addiction care, Mumba sees positive trends in the amount of education and training available in this specialized area. Dr. Mercy Mumba is assistant professor in the UA Capstone College of Nursing and author of a paper on this work published in the Journal of Addictions Nursing.